Today, Thursday, 12th January 2017, 7:00pm. Valerie Connor will participate in a public conversation with Ronan McCrea on the occasion of his current exhibition MATERIAL(s) at Green on Red Gallery. (Spencer Dock Luas stop 100m). Valerie Connor is a freelance project curator and educator currently undertaking postgraduate studies in online learning practices. She is one of the programme team teaching photography at DIT and an external examiner at LSAD. Recent writing includes essays for ACA Public and Pallas Projects / Onamatopee. Ronan McCrea’s current exhibition MATERIAL(s) which runs through 21 January 2017, marks a significant development in the artist’s practice. 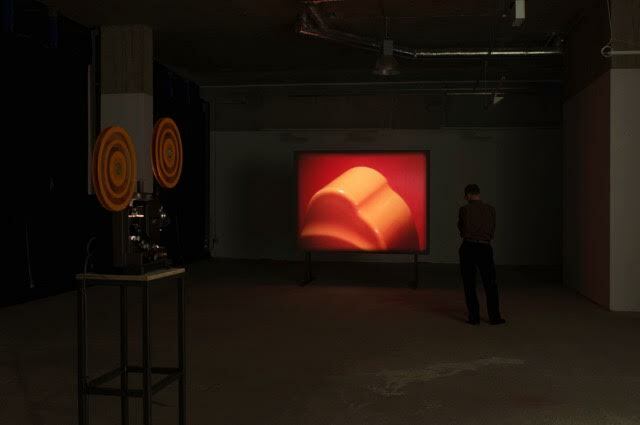 The installation of three new projected 16mm film-works brings together recurrent concerns in McCrea’s diverse artistic practice. These include investigations into the appropriated and found image, celluloid materiality, reproduction and indexicality, artistic and personal genealogies and the institutions and processes of pedagogy. The starting point for this body of work is a collection of instructional 16mm films on mechanical engineering produced by the BBC in 1972. Its scope covers educational documentaries on other topics, including a film about the sculptor Henry Moore. All were salvaged by the artist from a college engineering department in the wake of film's obsolesce as a didactic tool. Through a laborious process of cutting and splicing of this found material, McCrea draws on tropes taken from avant-garde Structural film - also from the 1970s - from the Cut-Up and from the procedures of early Conceptual art, re-constituting the fragments into new formations, with new affinities. The resultant works, which are material objects as much as images, stage the apparatus of projection, looping and spectatorship in response to the scale and raw interior of the gallery’s architecture.